Looking for a quiet window AC that won’t keep you up at night, or need you to pump up the volume on the TV just to hear a bit of dialogue? We know the feeling. Window air conditioners­ are a great way to efficiently keep a room in your home cool, without a huge hit to your wallet or the hassle of calling someone out. However, most of us have been unfortunate enough to experience what a bad window air conditioner is like; inefficient, unable to cool properly, and above all else – loud. The window AC’s of old were more like angry goblins that sat hunched in the window – shaking, rattling, and whirring, as if they had a personal vendetta against us. Thankfully, those days are long gone. We’re here to bring you our guide to the quietest window AC’s on the market right now. While we can’t guarantee that we’ve covered every make and model out there, each air con on our list has our personal recommendation – made not only for their great quality and value, but also that they’re been put together with the comfort of our ears in mind. To make certain that you’ve found the machine that right for you personally, we’ve also put together a quick ‘Buyer’s Guide’ that goes over the main aspects that change from window AC model to another. That way, you can find out what type of window air con would be ideal for your space (high powered, easy to use, great value for money, etc. ), and focus on buying an appliance that’ll match your needs exactly. While it’s a little on the powerful end, we couldn’t resist giving our top recommendation spot to Frigidaire’s FFRA1022R1 10,000 BTU model. It’s hands down our best find for an air conditioner that runs quietly (especially in it’s sleep mode), but also – just works really, really well. The electronics looks great and are easy to use (and accurate! ), and it packs plenty of power that it can use efficiently (with a top of the range energy efficiency ratio). Plus, you can really tell it was made with the end user in mind. With everything from 8-way air flow controls, economy mode, sleep mode, and a great easy-to-clean air filter. All we can say is that our bottom line is this: if you want your air conditioning problems solved, pick up this model today. 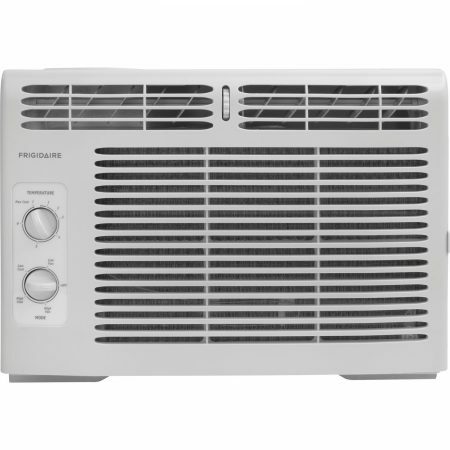 If you’re just looking for a little bit of extra cooling power without a huge price tag – Frigidaire have also come out with this great 5,000 BTU Mechanical model. While it only has mechanical controls and none of the modern features, it’s a quiet little runner that’ll keep a small room cool on its own, or even help your central AC with a larger room – all with an unbeatable low price. Note: We are in no way affiliated with Frigidiare! It just so happened that these two models deserved our overall top and best value spots. While all window air conditioners are built with cooling in mind, different makes and models are better for different things. Here, we’ve outlined the main aspects that change from model to model, so that you can determine which one will be the best fit for your own home. Our first stop is the power of each machine, measured in British Thermal Units – or BTU. A BTU is simply a measure of how good the appliance is at converting warm air into cool air (or more specifically, the conversion efficiency of heat into electrical energy). An air conditioner’s BTU capacity is one of the most important aspects, as it directly influences what size of room the window AC will work best in. 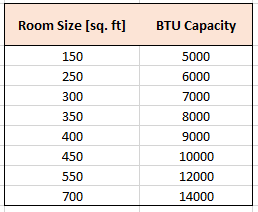 Check out the table below for an idea of what level of BTU’s you’ll need for the room you want to install the air con in. It’s worth noting that while getting an AC which has too low of a capacity won’t cool properly, getting one which has too high of a BTU count can also be a bad thing. If the air conditioner is too powerful, it can make the temperature drop too quickly for the moisture in the air to also be removed. This leaves a room feeling cool, but a bit clammy at the same time. Like Goldilocks, you want it to be juuust right. and/or if it’s poorly insulated. If the room always has a lot of people in it, add around 600 BTU per person. If it’s a kitchen you want to keep cool while cooking, add 4,000 BTU. Finally, if the room is shaded from the sun, reduce the capacity by 10%. Okay, let’s talk about the all-important quietness of a window AC. Unfortunately, manufacturers still haven’t come around to the idea of posting up the maximum decibel levels of their machines. However, most modern machines worth purchasing (including all of the ones reviewed below) have brought down their operating noise to a minimum level. 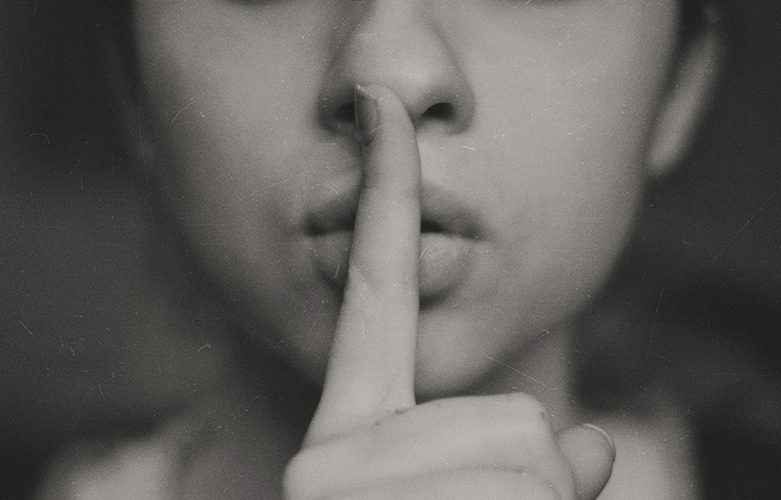 So while an air conditioner will never be whisper quiet (you’ll always need a fan), the ones we’ve listed will only bother you with a low level of white noise. That being said – there is a big factor that can help reduce noise to a minimum. Which is the level of modern features on an air conditioner – and how you use them. Multiple speeds – to cool a room down quickly, then keep a constant temperature with minimal noise, effort, and energy. The energy efficiency ratio, or EER, is quickly becoming a top measure used to compare air conditioners. So much so, in fact, that every modern window AC listed on Amazon.com has a certificate (included in its images) to let you know the energy efficiency ratio of the air conditioner. The EER is a measure of how much power each machine needs to run at full capacity. It’s a measure that will let you know the approximate cost of using the air conditioner over an average year. Generally, these ratios max out at about a 12.0, and you probably won’t want to look at anything below an 8.0. A quick note on window ac installation – which is to make sure that the model you’re purchasing will fit into your own window. The majority of window air conditioners are designed for single and double hung windows (vertically taller windows, which open vertically). However, there are also models which are designed for sliding or casement windows; these are typically much slimmer, but also taller. As well as making sure the model will fit your window type, it’s also worth giving the dimensions a quick check to make sure they’ll fit. Despite being called window air conditioners, a lot of models can also be installed through the wall. If a wall installation is what you’re after, make sure to check in the manual (available on the models Amazon page) to check that it fits. As with window ac’s, give the dimensions a double check – and unless you’re very handy with some DIY wall destruction, we recommend hiring out a professional to help you out. As well as the features we mentioned that help reduce noise, there’s a few other aspects that can set one air conditioner apart from the rest. As well as those already mentioned (timers, multiple speeds, economy modes, digital thermostats/controls), the quality of air filter within a model can also vary, as well as having multiple gears that let you adjust the flow of the cool air. Value for Money / EER* – We agree that quality is worth paying for, but does the price reflect the value? Who says you need fancy controls and setting to make a good air conditioner? 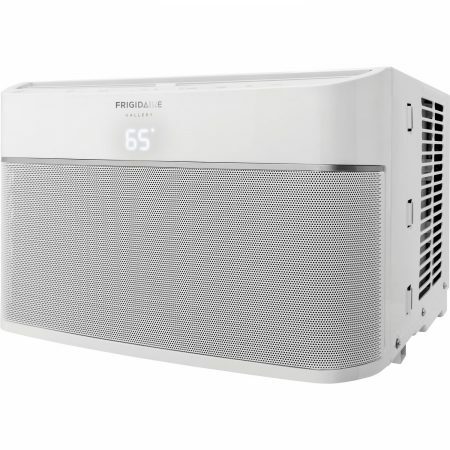 Despite being light on power and without any electronic controls, Frigidaire’s 5,000 BTU model is the #1 bestselling window air conditioner on Amazon.com. This really goes to show that people don’t want always want an appliance with all the frills and sparkles, but would rather have a simple machine that comes in at an unbeatable price, and still does a great job. This Frigidaire model is one of those rare appliances that hold onto the solid and reliable build quality of the past, without the need for modern additions that would only raise the price. It’s got no electronic controls, no timers or digital thermometers, and no economy mode. However, what it does offer is great energy efficiency, price, cooling capacity (for it’s size), and reliability. This is a great model to take home if you’re looking to keep a smaller room cool, or if you want to save money by reducing the strain on your central AC, letting you keep it at low power while this Frigidaire model works in partnership to cool your main living space. While it’s not the most powerful or the most modern, we love this little machine because of its simplicity and reliability. Perfect for anyone who simply wants a bit of extra cooling power in their home, and isn’t bothered about hi-tech parts or features. An ideal budget buy that doesn’t lack in quality of parts. A fully featured and efficient air con, without a high price or excessive power. This Keystone model is a great solution if you have a small space, but are worried that a 5,000 BTU machine might not cut it. Even though it’s not got too much power behind it, it’s still fully featured – meeting modern standards like programmable timers and an included remote for your convenience. There’s also a broad range of adjustability between multiple cooling settings and fan speeds, meaning you can adapt the AC for a wide range of heat conditions. There’s even also a sleep mode built in, which brings the room down to your preferred temperature, then lets it very slowly rise in temperature. 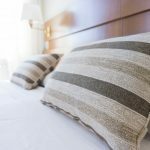 Allowing for this small increase means that the air conditioner doesn’t have to work nearly as hard, and will instead stay much quieter as you drift off to sleep. To top it all off, the energy efficiency ratio is also great – coming in at 10.7. This, coupled with a competitive price on Amazon, makes this Keystone model a great solution for any small-medium sized room. 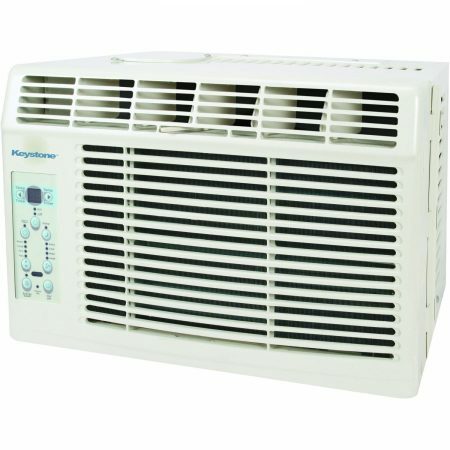 This Keystone model is another great solution for anyone who’s not in need of an air conditioner with a ton of power. The full set of modern features and the remote make it easy to use (with a broad range of settings), with a great energy efficiency and competitive price to top it all off. Ideal if you want the benefits of a modern machine without a high-powered price tag. High quality, easy to use, and enough for any medium sized room. A fantastic all-rounder. 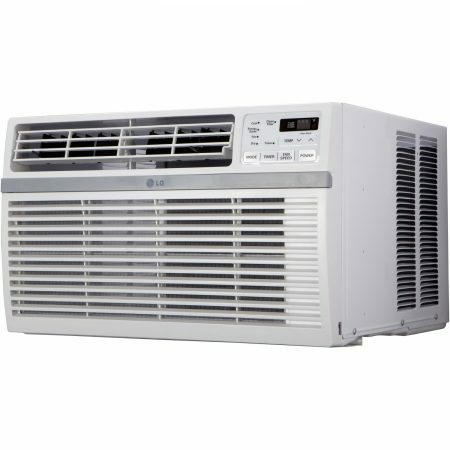 LG’s 8,000 BTU window air conditioner is our recommendation for a great, well-rounded and well-equipped AC. It’s controls are easy to use and intuitive, with a high quality filter that’s subtly tucked away underneath the LG logo on the front of the machine. 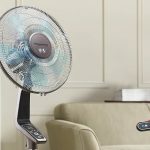 With an 8,000 BTU capacity, this model is well-suited to any medium sized room, and the 4-way adjustable gears to direct air flow mean that you can target the cooling to one area of the room. In terms of the build quality – the air conditioner is pretty solid. We’ve found a few horror stories of people reporting a large ‘clunk’ noise whenever the compressor turns on. However, in the cases where the customer contacted LG, they actually sent around a repairman free of charge; who fixed the problem (the compressor had come loose in shipping, and so was hitting off of another part inside of the machine). If anything – this goes to show your warranty will be covered by a company who are keen to look after their customers. While we’re personally not big fans of the way this LG model looks compared to other high quality window AC’s, functionality wise – it’s top notch. All of the modern features are covered, the energy efficiency ratio is great, and the controls are easy to use. Well-suited to medium sized rooms and from a company who’ve proven themselves at looking after customers, this is a great window AC for any modern home. Check it out here. Next up on our list is a wild card – and if you’re after a truly modern air conditioner, you’ve hit the jackpot. Frigidaire have brought out what they call a ‘smart air conditioner’. In other words, they’ve really upped the level on this one in terms of modern looks and features. If there’s one thing window AC’s are not known for – it’s definitely good looks. However, Frigidaire have somehow managed to pull it off here, with a model that looks more like a digital speaker than a window AC. This aesthetic is equally matched in the electronic display and controls, which are almost too sleek and futuristic to warrant being used on just an air conditioner. On top of looking great, almost every feature under the sun has been incorporated into this machine. On top of all the standard features (programmable timers, remotes, sleep and economy modes), this air conditioner even has WiFi and its own app for your mobile phone – so that you can control it from anywhere. However. Pushing the boat out with technology often comes at a cost, and there’s a few common issues with the ‘smartness’ of this smart AC. One being that the digital thermometer display, while looking great, can sometimes be inaccurate (though this may just be down to making sure the air filter is kept clean and clear). Second is that the mobile app, while a great idea, often encounters errors or have wifi issues. Hopefully by the time you’re reading this, a few updates to the mobile application will have solved this. We think there’s not too much we can say here, because with an appliance like this – you’ll likely have already decided whether it’s your kind of style or not. For some, the hi-tech looks and features will be irresistible, despite a few working issues. For others, the incredible looks won’t mean much if it comes at sacrificing some functionality and reliability. Whether you love it or hate it, Frigidaire have really pushed this model to the front of the queue in terms of technology. Powerful, efficient, and easy to use - this one's a real knock-out. And here he is – the biggest and baddest of the bunch. While you can get monster-sized window AC’s that go up to significantly higher power capacities, 10,000 BTU is about the highest you’ll need to go if you’re looking to cool a large room in a standard home. If you’ve already our quick recommendation section – then you’ll know that this model is our top recommendation on this list of quiet window AC’s. So, why is that? Mostly, it’s down to how high quality, and how easy to use this appliance is. Setting aside the fact that it has enough power to cool almost any room (or even multiple), the digital controls embedded onto this machine are state of the art in quality and intuitive to use. Hooked into them is a very accurate thermometer, and on the top is an 8-way gear system to control the direction of the cool air. The air filter is also top notch, being easy to clean, but efficient enough to keep out any outside odors – leaving you with crisp and clean air. There’s also two alternative modes that you can run the machine in; sleep and economy. While the first quietens the machine by allowing a very gradual increase in temperature as you drift off to sleep, the second saves you money by switching itself off once the temperature is sufficiently cool, and staying that way (for example, in the evening once the air gets naturally cool, it will automatically shut itself down and stop using electricity). This model is perfect if you simply want to get your air conditioning problem solved – no questions asked. It’s powerful, easy to use, fully featured and reliable. 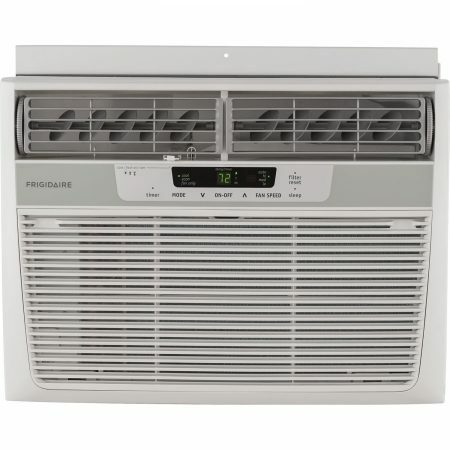 While it’s not the cheapest option, this Frigidaire model will provide you with an effective and efficient air conditioner that you can rely on for years to come. 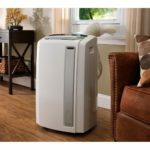 For an alternative cooling solution that’s focused on one area of your home, check out our guide to portable air conditioners – where we’ve also focused on finding the most quiet appliances to include in your home.